Gibbs’ online accounts comprise one of the broadest social media strategies for reaching fans of the sport. 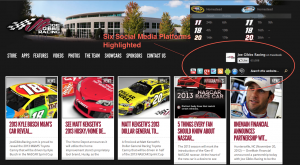 The team site, www.joegibbsracing.com, is up to date with timely features, and the homepage points to six social media platforms, including a mobile app for iPhone, Blackberry or Droid. The team maintains active social media accounts on Facebook, Twitter, YouTube, Pinterest, Instagram and FourSquare. Hendrick also has an active and diverse menu of social media platforms including a mobile app. Gibbs’ social media score bested Hendrick’s by a single point because of its slightly more effective home page promotion of its social media platforms. 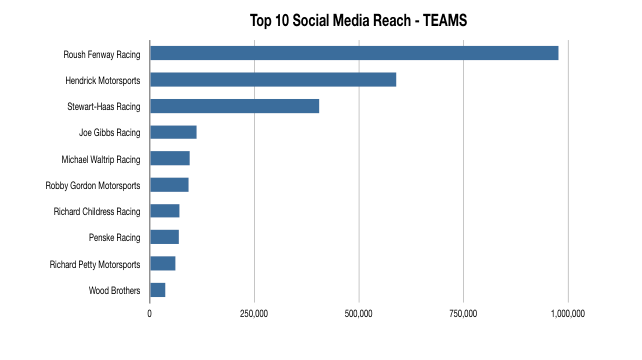 “Some drivers, teams and sponsors in the NASCAR industry are taking steps to reach and engage larger audiences using social media, while others are missing opportunities,” said Tuckahoe Strategies president Ramsey Poston. 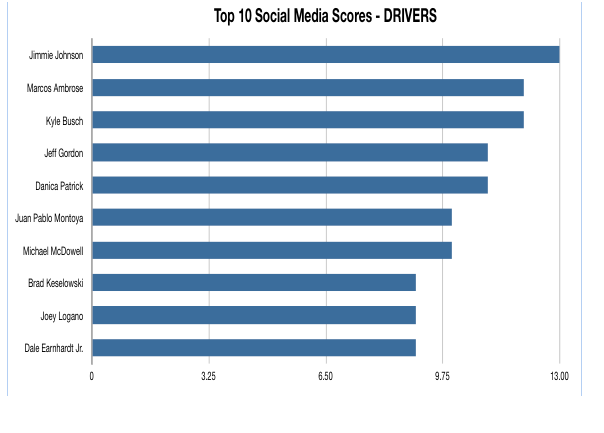 Johnson is the most comprehensive user of social media among drivers. He reaches his audience on a broad array of platforms including: Facebook, 657,062 page likes; Twitter, 348,402 followers; YouTube, 265 subscribers; and Instagram, with an industry-leading 60,618 followers. 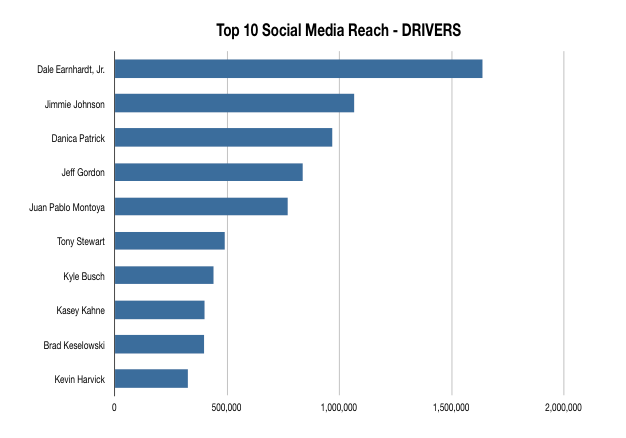 Johnson’s social media reach (the sum of all social media followers across platforms) is 1,066,347. This veritable “media machine” has a following larger than the circulation of the Los Angeles Times, which is the fourth largest newspaper in the country. The sport’s largest audience holder and content curator across the board is NASCAR. The sanctioning body regained a voice and a direct connection to its fan base this year after repossessing control of its online assets in a January 2012 agreement with Turner Sports Interactive. 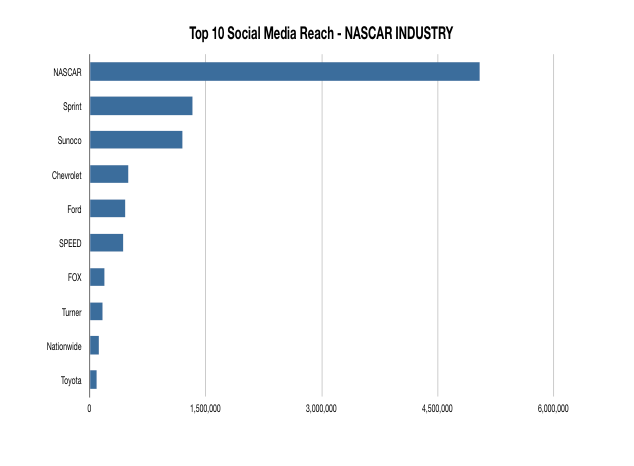 NASCAR’s total social media reach is an astronomical 5,044,070, more than double the daily circulation of the largest U.S. newspaper, The Wall Street Journal. 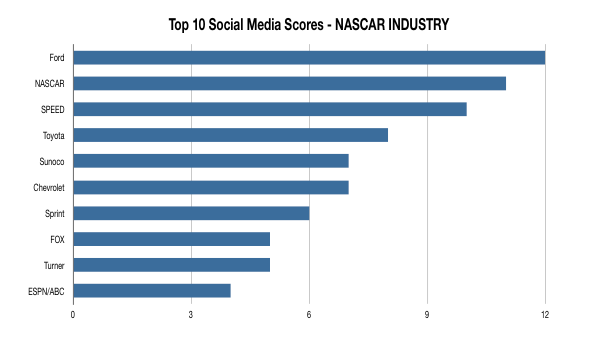 In fact, NASCAR commands the industry’s top position in terms of audience on Facebook likes (3,239,504), Twitter followers (841,027) and YouTube subscribers (5,430). The sanctioning body also has 1,420 followers on Pinterest and a staggering 956,689 circles on Google+. “Too often there is an over-emphasis on audience size. It’s far more important to have a quality, engaged following than just quantity,” said Poston. 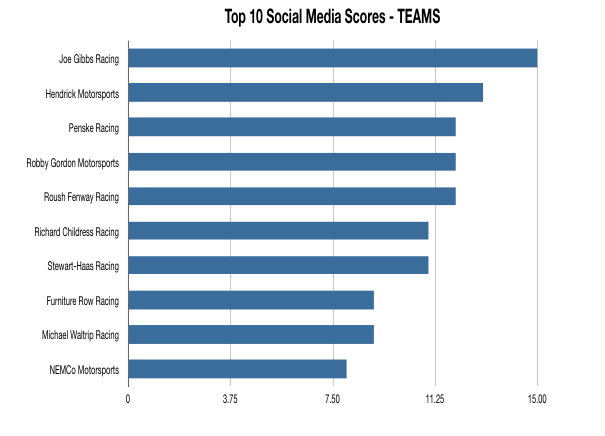 The team with the broadest social media reach is Roush Fenway Racing, with an audience of 976,755. The vast majority of this audience engages with the team’s Google+ account, which includes 912,961 “circles.” Both Hendrick and Stewart-Haas Racing are more balanced, actively utilizing a broad spectrum of platforms to reach their fans. Hendrick’s total audience is 588,889 of which 454,720 are Facebook fans, 128,929 are Twitter followers, 1,531 are YouTube subscribers logging 466,071 views, and 3,709 are Pinterest followers. The bulk of Stewart-Haas Racing’s total social media audience of 404,688 can be found on Facebook (237,107 likes), but the team also is active on Twitter (91,398 followers), YouTube (453 subscribers), Pinterest (1,442 followers) and Google+ (74,288 circles). Dale Earnhardt Jr. scored nine 9 points in the study placing him in the middle of the pack. However, NASCAR’s most popular driver holds the single largest audience for a driver at 1,637,697. About 90% of Earnhardt’s audience is concentrated on one platform, his Facebook page, which accounts for 1,470,212 likes. Earnhardt also has a robust YouTube channel with 1,630 subscribers and 610,714 views. Earnhardt maintains a Pinterest account that includes 231 followers and 124 pins, but it is difficult to find without any promotion from the homepage. Earnhardt does have a Twitter account with 165,855 “followers.” It is dormant so far, however, with zero tweets. “The goal for each individual and organization should be to build and activate its own ‘media machine’ by using the digital platform. All the tools are easily available and NASCAR is taking steps to help the industry expand its online presence,” said Poston. “Drivers, teams and sponsors are best off having a balanced approach to their online strategy,” said Poston. “Homepages should continue to be the primary hub of information. Social media platforms should be access points to reach and engage fans (and customers) and should ideally include photo and video sharing platforms for maximum exposure. “A well thought out online plan and content calendar can help drivers, teams and sponsors build a meaningful audience, which in turn provides a much better opportunity to control the message, improve opportunities to sell merchandise and, for teams and drivers, attract new sponsors,” said Poston. Another common misstep throughout the industry is a lack of shareable content. NASCAR is a photo- and video-rich sport with an avid fan base. Teams, drivers and sponsors would do well to utilize photo-sharing platforms, such as Instagram and Pinterest, and video sharing services such as YouTube or Vimeo. A number of industry websites feature terrific photo and video galleries but they are isolated on the site and not easily shareable. While almost every industry entity evaluated could take steps to improve their position, Goodyear stood out for its lack of any social media presence at all. In fact, one can find virtually no mention of NASCAR at all on its online properties. 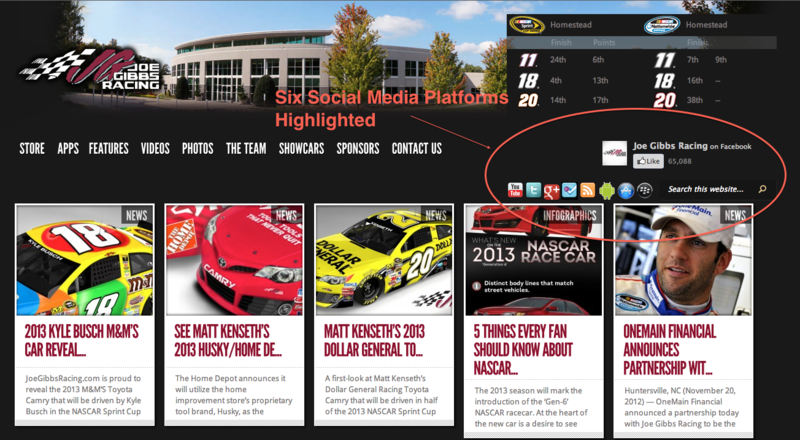 There is no mention of NASCAR on Goodyear.com and no dedicated Facebook page or Twitter account. By contrast, NASCAR’s fuel supplier, Sunoco, has an active, racing-related Facebook page with nearly 1.2 million likes and an active Twitter account with over 8,000 followers. Sunoco is successfully marketing its NASCAR partnership on social media platforms, in turn better positioning its own corporate brand. NASCAR title sponsor, Sprint, also is expanding the reach of its corporate brand through its NASCAR-related social media presence. Sprint is active on Facebook, Twitter and YouTube via its brand ambassador campaign, Miss Sprint Cup, with a social media reach of more than 1.3 million. Tuckahoe Strategies is a full service communications company providing brand building, public relations services, crisis management and litigation communications. Poston has worked in the sports industry for over ten years as a communications expert. Based on online presence, number of social platforms activated and timeliness of updates. Highest score possible is 20. Survey data by Tuckahoe Strategies. All rights reserved. Audience figures are compiled by adding Facebook “Likes”; Twitter followers; YouTube subscribers; Pinterest followers; Instagram followers, Google+ Circles. Survey data by Tuckahoe Strategies. All rights reserved.